Are you in a rush in the morning but still want to start your day with a healthy meal? Then you urgently need some easy breakfast smoothie recipes. I’ll present to you my favorite whole food plant based (WFPB) drink and also smart ways how you can adjust it to your individual taste. 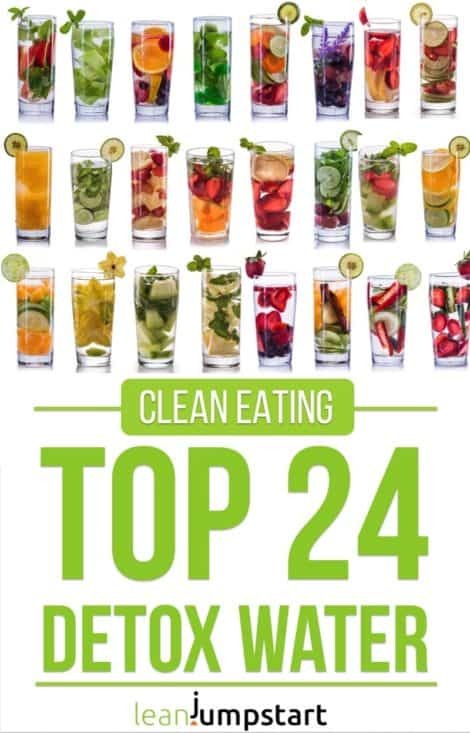 My clean eating recipe tastes great and is inspired by Dr. Michael Greger’s “daily dozen”. This is a list of essential plant foods that you should eat every day for best health and well-being. Dr Greger is also the founder of nutritionfacts.org my go to site for information on all things health and nutrition. I’ll share more about him at the end of this blog post. 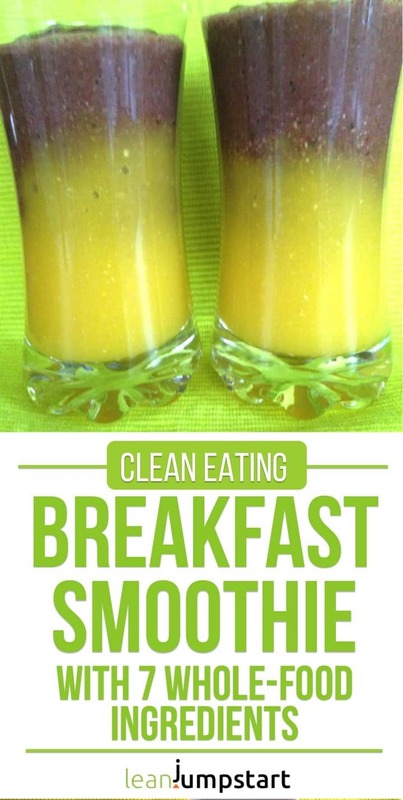 Healthy breakfast smoothies are super quick to prepare. What is more, they provide you with all the necessary nutrients you need for an energy rich start in your day. You just need a few whole food ingredients that you blend in your food processor. In that case the result will look like the photo below and might discourage you from drinking. Fact is, we all eat with our eyes…If you invest an extra little step however (see instructions) then your drink will look a bit more appealing like the photo above. Most smoothies call for fruits. Which fruit types you use is a question of taste and season. Bananas will make your drink pretty creamy and supply a natural sweetness without added sugars. Red berries add an appealing color. In my favorite healthy recipe below I use blackberries from our garden (stored in our freezer) and frozen mango chunks I buy at Aldi. It is a smart idea to store your fruits in your freezer. As a result I have always frozen fruits at hand. Did your know that you can also buy frozen berries in your discounter? A special tip how to simplify this recipe you get at the end of this blog post. The best recipes contain of course also vegetables. Zucchini, red chard or baby spinach is my first choice as they deliver an extra portion of vitamins and minerals and you almost don’t taste them. Rolled oats or other grain flakes (whole rye, whole barley, etc.) grant a proper portion of fiber and also keep you satiated for longer. 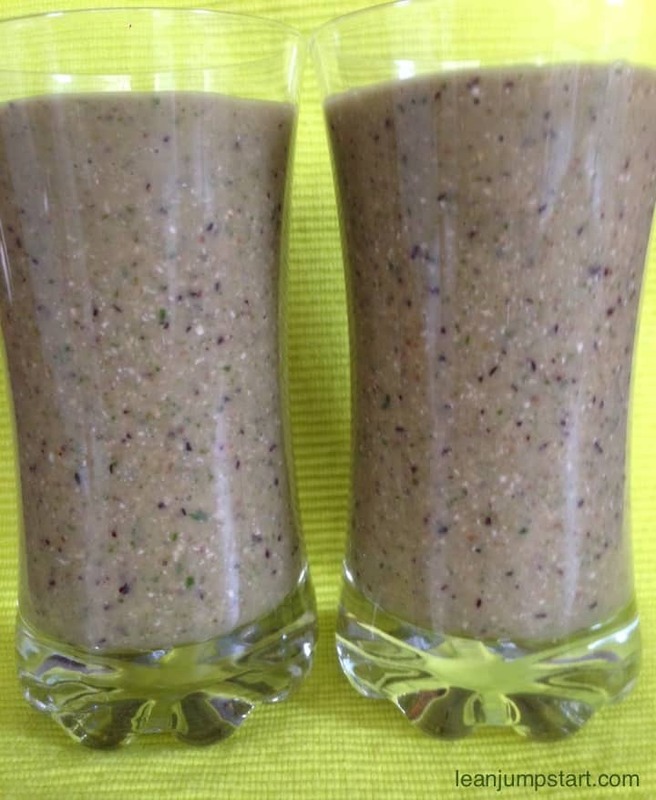 High fiber ground flax seeds are an essential ingredient for your breakfast drink. Flax seeds are known as one of the richest plant sources of essential omega-3 fatty acids. They also average about 15 times more cancer-fighting lignan content than other seeds. Several evidence-based studies show significant benefits for weight loss, blood sugar, cholesterol, blood pressure or inflammation. You can pimp up your drink with spices like ginger, cinnamon or vanilla. Ginger however is my absolute favorite spice and turns my fluid breakfast into a liver cleansing miracle. Also lemon juice shouldn’t miss in a wholesome breakfast. With its citric acid is a contributing factor in causing less kidney stones. It’s also a natural diuretic assisting your body to flush fluids regularly. At the end you mix everything with water. I mostly add just 1-2 cups of water. 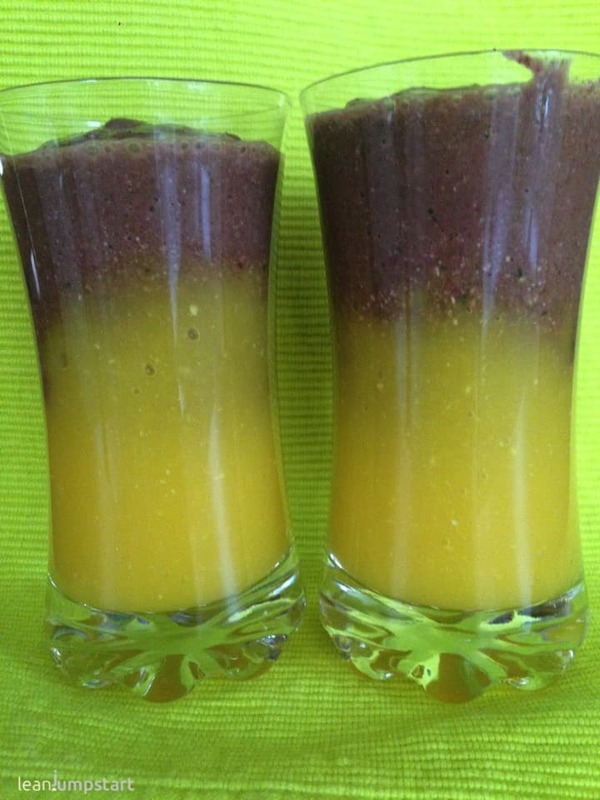 Place mango chunks, blackberries, rolled oats, ginger, lemon, baby spinach, and water in a blender. Blend until smooth and creamy, about 2 minutes. If you want the look and feel of the photo above then just blend mango chunks and ginger in the first step. In the second step add the remaining ingredients in your blender, mix again and pour it over the mango base. For maximum taste and freshness, smoothies will only keep well for around 24 hours. Dr. Michael Greger is a physician first and foremost and the founder of NutritionFacts.org. Whenever I want to know more about a topic on nutrition and health I research his site and/or videos to see what science has to say. So just in case you ask yourself, where I find all those evidence based studies I’m citing in my posts, now you have the answer. NutritionFacts.org is a truly unbiased source that just follows the science behind all the studies that are published. Additionally nutritionfacts.org is a 100% non-profit website. You will never see an ad on there and Dr. Greger does not sell any supplements. This nourishing and clean fruit smoothie contains depending on the recipe between 400 and 500 calories. It provides your body with energy for a long time and keeps you wonderfully satiated. That’s exactly what you need for a fitter jumpstart in your day. Maybe the idea to mix 7 ingredients in the morning seems intimidating to you. Here is a shortcut provided you don’t need the attractive layer effect. What you could do is to prepare several portions with small freezer bags in advance containing mangos chunks, black berries, spinach, ginger and lemon juice. In the morning you just pop it in your food processor, add oats, flax seeds and water, process and you are done. As liquid you could of course use also any milk you prefer. e.g. coconut milk, almond milk or soy milk. For an extra potion of protein you might want to add some nut butter or clean eating protein powder. Especially in summer time a frozen banana is a great addition to your vitamin bomb. If you are a vegetarian make sure to check out my simple and delicious strawberry banana smoothie with Greek yogurt and milk.